This is the perfect time to make stuffed peppers where I live, because green bell peppers and tomatoes are currently 97 cents a pound and a 630 ml can or jar of tomato sauce is also on sale for 97 cents! It’s super easy if you have leftover rice and lentils for this; otherwise you will need to make them first. Of course, you have to love peppers to make this recipe, and not just “kind of” like them. I save this recipe for weekends because the total time is 90 minutes. Skip to the end for a quicker variation! Green are the cheapest; red, yellow and orange are sweeter. 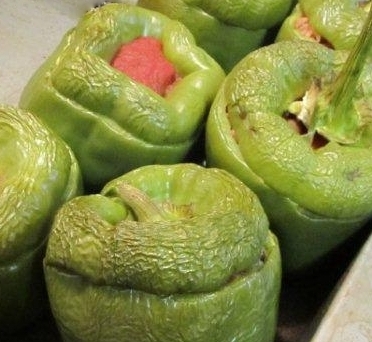 You will want to check each pepper at the market to see if it can stand up without help, LOL! Preheat oven to 350 F / 180 C. Grease the baking dish and set aside. Chop the tops off each pepper and save them. Of course you will want to remember which one belongs with which, ha ha! Hollow out each pepper, discarding the seeds and membranes. If your peppers lean a lot, you can chop a bit off the bottom to straighten them up for your baking dish. 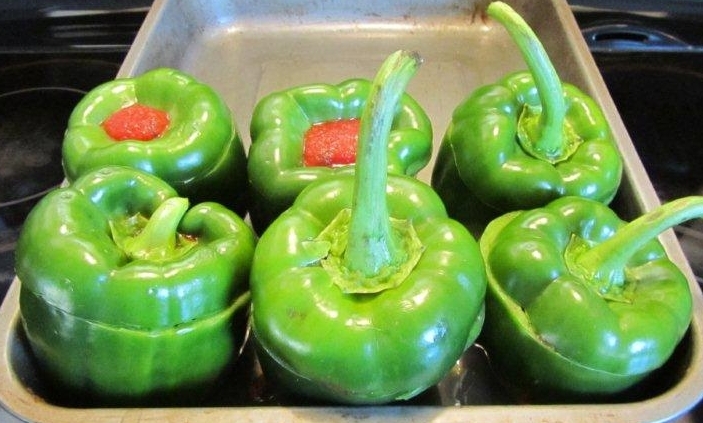 Stand the hollowed-out peppers in the baking dish. It’s fine if they lean against each other or the sides of the pan. In a large mixing bowl, stir the cooked rice, cooked lentils, 1 cup tomato sauce and the dried herbs, if using. Fill each pepper with the mixture – right to the top. Spoon some additional tomato sauce on top of each pepper (about 3 tablespoons). Put the tops back on the peppers to keep them moist while baking. Note: You can spoon more tomato sauce over the peppers while they bake, however, the sugars in the sauce may blacken in the pan. 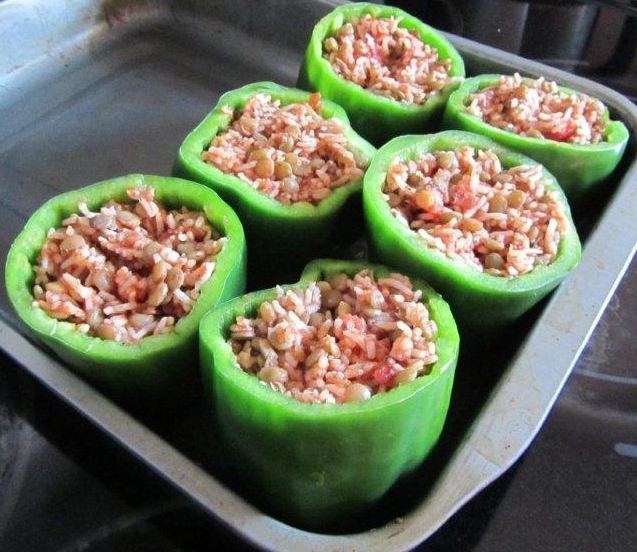 Bake for 1 hour, or until the peppers can be easily pierced with a knife. They should be very soft. The poor peppers will now be saggy, wrinkled, and maybe even a little fire-roasted where they touched the sides of the pan. In the last few minutes of baking, you can heat additional tomato sauce to pour over the peppers when served. If using grated cheese, remove tops from peppers, sprinkle with cheese, and broil until bubbly, 1-2 minutes. Lift the baked peppers onto plates using a slotted spoon. If you don’t think the peppers look cute anymore with their loosened skins, they can be cut in two from top to bottom to appear more impressive on the plate. 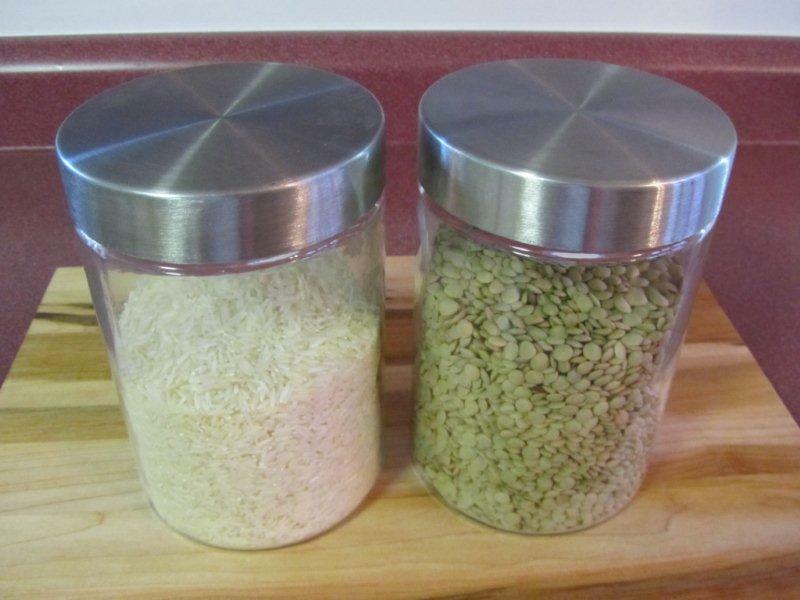 For the same flavours in a no-bake recipe, make the lentil and rice filling as above. Chop the green peppers and stir fry them until tender, then add them to the lentil-rice mixture and serve. This is meant to be an inexpensive recipe – you can certainly jazz it up with premium ingredients if you like. I’ve always wanted to stuff a pepper. Looks yummy and healthier than my mom’s recipe, which is yours minus the lentils plus ground beef/mince. I think I will have to try yours for our veggie-only nights. I used to make them with ground beef in my pre-veggie days and that worked fine, too. You didn’t need a lot, maybe 8 oz (before cooking) for the recipe. But I like not buying and preparing meat these days. My parents are growing peppers at the moment and we always end up with more than we can eat. This will be a perfect way to use them up without wasting them! We love the red peppers best! I have never grown them (short growing season) but that would be nice! Thanks – as long as you love peppers, it works! Nice – not sure it’d pass the BF’s rigid standards, which involves meat meat and meat!! I have made variations of them before though, for my family. I was thinking they’d be good with taco sauce and black beans. Of course, the traditional versions have ground beef! Would be interested to know what veggies you like in them! Usually sautéed onions, garlic, and spinach (since I almost always have those on hand), but sometimes other things that need to be used up – peas, carrots, cauliflower (though the carrots and cauliflower are better if they’re shredded first rather than left in chunks). I wish my kids would eat these, they look at that green vegetable and think it’s going to bite them! I’m sure I was the same at one time, but I just tell them “Just try it”… nope. They act as if they might die! You are most welcome here, Tammy! I sure wouldn’t have eaten them when I was a kid either! When I used to work at the Turkish restaurant we made these but we also put sultanas (raisins) in them and they were tasty 🙂 I have a whole lot of red peppers in the fridge and some mince in the freezer so I might give the meat ones a go this week. I would definitely like them with sultanas; I’ll try that next time! Forgive me, I have to ask, did they have paprika?! You know what makes me crazy? My kids like every single ingredient in this in isolation. Put them all together and you’d think it was the apocalypse on a plate. One day. 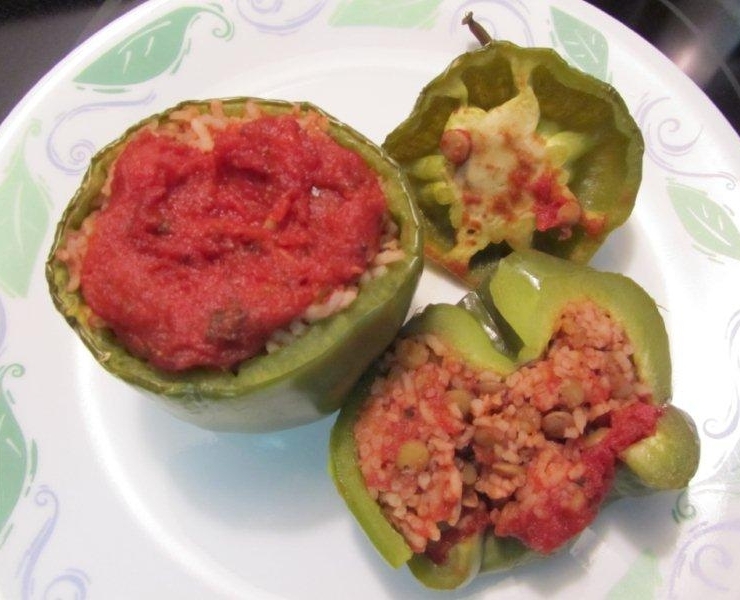 One fine day, they will appreciate the simple and pure goodness of stuffed peppers. Ah ha ha, maybe when they are 20.